Gwalior. Rashtriya Swayamsevak Sangh’s Sarkaryavah Sh. Bhaiyya ji Joshi today said that the three day meet of Akhil Bharatiya Pratinidhi Sabha reviewed various activities of the organisation and discussed contemporary issues. Addressing a press conference on the third and final day of the ABPS, Sh. Bhaiyya ji Joshi said, the RSS has decided to take up a new initiative in the field on environment protection and conservation. He said there will be a greater focus on ‘Samajik Samrasta’. “The RSS’ work has reached at a certain level and now we feel that it is time to take a big leap in terms of expansion of the work,” said Sh. Joshi. The ABPS has also passed a resolution on ‘Need to Protect the Traditions and Beliefs of Hindu Society’ in context of the Sabarimala issue, he added. Bhayya ji Joshi also made statements on ‘550th Prakash Parva of Shri Guru Nanak Dev ji’ and ‘Centenary of the inspiring martyrdom at Jalianwala Bagh’. Elaborating upon the new initiative of the RSS, he said that the Sangh will take up various activities along with the society in the field of Environment protection and conservation through initiatives in three key areas- water conservation and water management, planting trees and eliminating use of plastic and other non-biodegradable material like Thermocol. Replying to a question, the Sarkaryavah said the RSS’ stand on Ram Temple is clear. It should be built at the place where it has been decided to be built. The movement on this issue will continue till the temple is constructed. On the issue of appointment of a mediation panel by the apex court, he said the RSS welcomes any initiative that can help resolve this issue to construct the Ram Temple. The RSS expects that the government and the Court would remove the barriers in the path of constructing the temple at the earliest. It is also expected from the mediation panel that they would understand the Hindu sentiment. Those in power are not opposed to the Ram Temple and there is no doubt over their commitment regarding this, said Sh. Joshi. Sarkaryavah Ji appreciated the government’s response in terms of carrying out air strikes at Terror camps in Pakistan in wake of Pulwama terror attack. He said that the fearless nations reply to the terrorists in similar language. Replying to another question on Article 370, he said the case related to Section 35A is in Court. It is expected that the government of the day will keep the viewpoint firmly. After a decision on this case is delivered, the issue of Article 370 will be discussed in light of this decision. 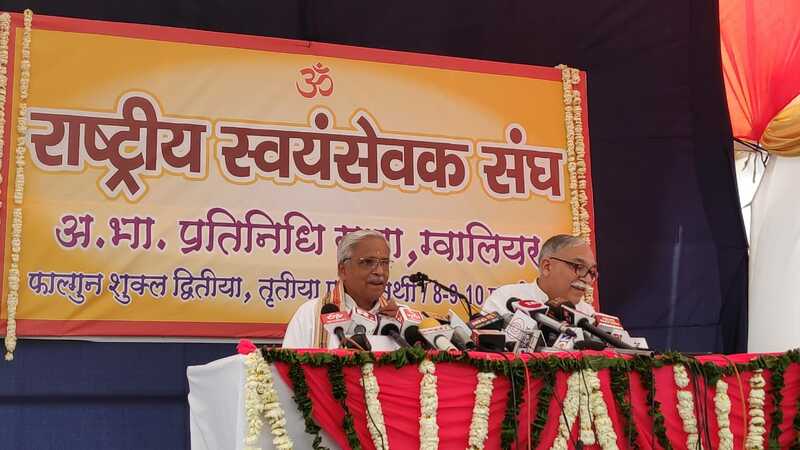 On the issue of Sangh’s role in elections, Sh Joshi said, the RSS’ role is clear. We will work for creating awareness to ensure 100 per cent voting. Our society has started thinking more clearly over the period time and the common people know who works for the betterment of the nation. Replying to another question regarding Court’s decisions on Hindu traditions in wake of its decisions on Jallaikattu, Deepwali crackers and Sabarimala, Sh. Joshi said that along with the Constitution, one can not ignore the importance of traditions and culture. Giving a decision according to the law is one thing and its acceptability in the society is another thing. So such issues should be dealt in the light of of our values and culture. And the guidance of those who are experts in these spheres should be sought.